I am going against the grain I guess. These cans are good, but they don't live up to the hype. The first time I demoed these they were going through a Creek headphone amp and after 20 minutes my ears were ringing. I told the salesman and he thought I was on glue. 6 months later I decided that I must have had a bad day and bought a set. I thought running them through my dedicated tube amp would be magic. Wrong, I don't know, I just find them BORING. I've owned Fostex, AKG 240, Sony's V900, Grado 225s, and Denon AH-D2000's. If you find them for a great price by all means try them out, but don't be so sure they will be the last set of cans you ever buy. One of my greatest purchases ever!!! These really make me fall in love with the music I listen to. Normally I just plug them straight into my laptop headphone jack and they still sound great. They sound better and better every day and make everything else I listen to sound empty by comparison. Poor quality cable, but is built to be easily replaced. Buy the Cardas upgrade and you will be happy. I bought these based on the reviews here, and paired them with a X-Can headphone amp, an Arcam CD-23 players, and McCormick pre-amp, pure silver sound interconnects. Initially, I was really disappointed. The sound was muffled. I purchased the Cardas replacement cable, which helped, and mounted the X-can amp on ceraballs, which also helped. But most of the improvement in sound came from just letting these break in for a several weeks. Now the sound is outstanding, excellent detail and balance. The phones are very comfortable as well. Great for late night listening after the rest of the house is asleep. Failure to convey any sense of a musical whole. I've had enough of all these reviews saying how great these phones are. They aren't. They are not uncomfortable, have a reasonable level of detail, and convey timbre well (you will get the feel of the insrtument) but that is not music. They have poor timing. Despite the detail, they often come across as veiled. They do not convey music. For example, listening to track 6 on Chick Corea's Works, the bass line is completely divorced from what everyone else is playing. On the other instruments, the notes appear to be being played at random instead of as a musical whole that hangs together and makes sense. I rarely listen to them because after a very short time I get bored, as they simply do not play music. Unfortunately 99.9% of hifis are the same, which is why these aspects are rarely reported (and why reviews tend to be of such little use). I cannot see how they could be recommended for jazz, as jazz is a genre that needs these qualities, and is usually very demanding of a system. Perhaps classical may play more to their strengths. Summary: to the casual listener, or the listener with a system that simply makes sounds and not music, you'll like them. If you are not greatly bothered about PRAT and simply want timbre, you'll probably be ok with them. But otherwise, stay clear. very overrated headphones, i find them dull,not involving,and somewhat dark sounding,im using them with a creek obh21 headphone amp maybe there not a good match with the creek headphone amp,im playing with the arcam cd 73 and denon 2900 player and they still give the same results,and for some to compair these headphones with 8,000 speakers they got to be on something,i own a pair of b&w 703 speakers($3,000) and they blow these away in every category,i know there different in certain areas namely imaging, soundstage but even with not good acoustics in our room there still alot better.I think grado headphones have a better sound i just dont like the upfront forward sound on them.Maybe im not a heaphone person afterall,overall i much prefure really good speakers. One more thing alot of people say these are good for classical music well let me just say i own over 300 classical cds from london decca to other labels some have very good sound others dont these headphones are not that good with classical music there better suited with pop or jazz mostly because of that lack of seperation and detail. Will find flaws in whatever recording is listened. Be prepared, they're not forgiving headphones. But that's great in my book. Non-forgiving. If the bass is off on the recording/performance, these guys will expose it. Weakness in some book, not in mine. I would consider myself an audio professional. These are the best phones I've ever owned (although not for on the job, since they're open eared). Have had no problems with the HD600s, so can't comment on the service. -Your speakers will hate you when you spend less time with them and more time with cans. I have owned these headphones for probably two years. They are very well likely my most prized possession and this review could be summarized in one word- perfect, but I won't write that, because they're not. The HD600s are just about as close to perfection as any other headphones and/or speakers will come. It's the balance, the coherence across the entire frequency spectrum, along with a 100% lack of coloration (in other words, total neutrality), and unsurpassed comfort that make these headphones reference quality. I may have never listened to the older HD580s or the new HD650s, but I don't need to. I am so happy with the performance of these phones, like the other 136 people who have posted their thoughts below mine. It really is a must-audition. Everything, build quality makes you feel like a king, comfort is unsurpassable, sound is sublime. My wife's first words - "why does this sound better than the hi-fi sysyem that you have spent thousands on". Ooop! The truth is that these Senn HD 600 are magical. I challenge all but the best hi-fi system to keep up with them and are they comfortable - wow, I have laid on my living room floor and just forgotten about the fact that i have them on. Of course, garbage in garbage out. You will have to have becent quality input into the headphones that goes for the head amp as bell as the pre amp or whatever else you are using as a source. I am not sure that these headphones will turn a cheap source (pigs ear) into a great sound (silk purse). Total luxury and at the price, how can I complain? Nothing that I can add to the reputation of these headphones. Senn HD 340 (long in the tooth), Grado 125 (uncomfortable), Senn noise cancelling (great for the plane or the gym but not for serious listening), Apple buds (you must be joking - and I am an Apple o'holic) and tons of others over the years. I've used many different brands and types of headphones over the years and these are without a doubt the best overall value for the $. Like others in this forum have said, these cans rival the sense of envelopment one feels when listening to seperates costing $$$. Mid and high levels sound fantastic and lower bass notes come across sounding real and dynamic-- never flat or muddy unless thy're meant to (all recordings aren't created equally). I have found these headphones to be very revealing and capable of creating a realistic and believable soundstage. However, I've found that when listening to recordings that are sub-par these cans aren't overly critical to a fault which makes the listening experience bearable unlike w/ some other products. These like to be fed the proper amount of power so I do recommend investing in a proper head amp, and if you're especially into CL or just want the best possible performance look into aftermarket cables. Like everyone else before me on this site I can't rave enough about the design, ergos and aesthetics. Even if you do own a lot of seperates etc, these are great for those times you just want to mellow out and enjoy music as it was meant to be heard. Strongly recommended. Great value, great audiophile sound quality. Not compact enough for jogging, or walking. The VALUE: I purchased the HD HD600 headphones to use with my home audio system, as well as with portable audio devices occasionally, because I wanted superior sound quality at a reasonable price - $225 on eBay for new phones in unopened box ($400+ MSRP). 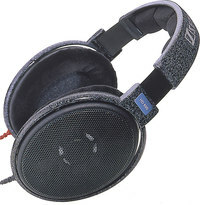 These headphones have received great reviews from professionals, including Headphone.com. Most portable audio devices can drive them to fair volume without additional amplification, although they do benefit from a good headphone amp. I use them primarily for listening to CD's on my cheap Sony Walkman, or on my Dell Latitude Notebook, which has an excellent audio sound card, with plenty of power to drive these headphones. They also sound exceptional with my Music Hall MMF CD25 1+ upgrade, and Musical Fidelity XCAN v3 head amp. THE SOUND: The sound is exceptional - crystal clear, and "ruler flat," across the cmplete audio spectrum - it is everything that has made Sennheiser headphones the World standard for audiophile performance. The HD600's are comfortable, open and airy - both physically and sonically. These phones will reveal every nuance of the recording and audio source - whether good, or bad, which lesser phones mask. The sound is full, somewhat warm, dynamic, open and airy with an excellent image. The bass is deep, tight, clear with impact, without muddy boom (unless the recording reveals it). The mids are clear, well-defined, warm, and full. The highs are clear, crisp, well defined, and extended, without being overly harsh. You can hear all the nuances of the musical performance: the sqeak of the fingers and rasp of the bow on the strings; the slap of the hand on the bass; the mellow timbre of the horns; the breath and saliva on the lips of the horn player, or vocalist; the detailed fibers of the brushes on the cymbals, the thump of the piano stops, and more. And... they're even more exceptional if upgraded with the Cardas Cable for about $150 - even more bass, and treble extension, dynamic impact, detail, air and soundstage. CONCLUSION: At $200+ these headphones are an exceptional value - there is simply nothing that compares to them in this price range up to about $350+ on Ebay, and $600+ at MSRP. Try them and experience audio nirvana! Senn HD280 Pro, Grado SR125 & 325i, Bose Triport, and assorted cheap Sony's.